It is not uncommon to see a missing cricket behind a chimney used to divert water around the chimney so water does not dam behind the chimney. A cricket or saddle shall be installed on the ridge side of any chimney greater than 30 inches (762 mm) wide. Cricket or saddle coverings shall be sheet metal or of the same material as the roof covering. It looks like a mini-roof behind the chimney. Rainy day fact: Did you know.... one inch of rain falling on 1 acre of ground is equal to about 27,154 gallons and weighs about 113 tons. (1 gal = 8.35#) This being said, a 50 gal water heater weighs approx 417.5#. Is your water heater properly supported? If it is in the attic. it needs to be supported on 2x4s, laid together as a solid platform under the tank. The 2x4s need to be supported over the appropriate width of ceiling rafters. Most of the North Texas area soil is expansive type clay. Therefore, proper care of your home's foundation is very important in preserving the integrity of the structure. Clay soil has the ability to expand (when wet) and contract (when dry) at alarming rates. This requires that an even and rather constant level of moisture be maintained around the entire house. Defects in foundations occur when the structure does not move as a unit. 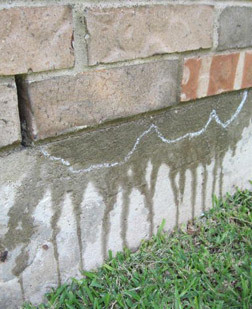 This could occur when one area around the foundation is continually wet, while other areas remain dry. Suggest a soaker hose approx 1.5' from slab during summer months. The SW corner is your hottest area during the summer. Keep the soil against the slab with proper watering. Have YOU ever taken a shower/bath then looked outside on the exterior wall for water leaks?